The 70th Emmy Awards nominees were announced Thursday morning and HBO juggernaut "Game of Thrones" led the way earning a leading 22 Emmy Award nominations, including for best drama series. The fantasy saga based on George R.R. Martin's novels is a two-time best drama series winner and back in the running for honors for its next-to-last season after a production delay kept it out of the 2017 competition. The previous high for "Game of Thrones" was 24 nominations in 2015. It got 23 nods in 2016 but wasn't eligible last year. 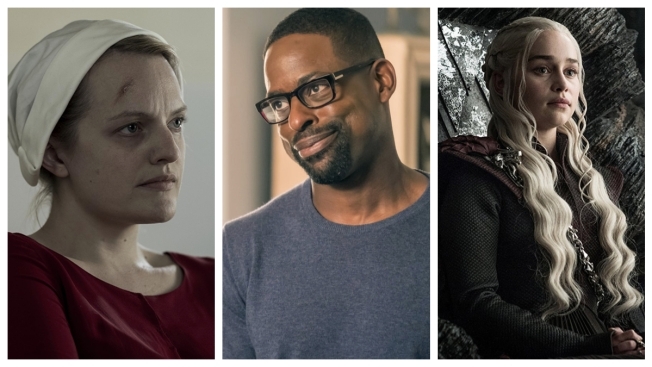 Its biggest adversary is "The Handmaid's Tale," the dystopian drama that last year captured the top series prize and acting awards for Elisabeth Moss, Ann Dowd and Alexis Bledel among its eight wins. Upon hearing the news several Emmy nominees took to social media to express their delight. The nominees for best drama series include: "The Americans," ''The Crown," Game of Thrones," ''The Handmaid's Tale," ''Stranger Things," This Is Us" and "Westworld." The nominees for best comedy series include: "Atlanta," ''Barry," ''black-ish," ''Curb Your Enthusiasm," ''GLOW," ''The Marvelous Mrs. Maisel," ''Silicon Valley" and "Unbreakable Kimmy Schmidt." The nominees for best actor in a drama series include: Jason Bateman, "Ozark"; Sterling K. Brown, "This Is Us"; Ed Harris, "Westworld"; Matthew Rhys, "The Americans"; Milo Ventimiglia, "This Is Us" and Jeffrey Wright, "Westworld. The nominees for best actress in a drama series include: Claire Foy, "The Crown"; Tatiana Maslany, "Orphan Black"; Elisabeth Moss, "The Handmaid's Tale"; Sandra Oh, "Killing Eve"; Keri Russell, "The Americans"; Evan Rachel Wood, "Westworld." The revival of "Roseanne," canceled because of star Roseanne Barr's racist tweet, drew only one major nomination, a supporting actress nod for Laurie Metcalf. Donald Glover's "Atlanta" is the top comedy with 16 bids. It will face newcomers including "The Marvelous Mrs. Maisel" and "Barry," starring Bill Hader. "Saturday Night Live," riding high with its relentless pillorying of the Trump administration, was rewarded with 21 nods. Allison Janney of "Mom," who has won two supporting actress trophies for the show and last year tried competing in the lead actress category, can claim her own big-screen awards aura: She received an Oscar for "I, Tonya" earlier this year. The Emmys ceremony airs Sept. 17 on NBC with Colin Jost and Michael Che of "Saturday Night Live" as hosts.